Colorectal cancer (CRC) is the third most commonly diagnosed cancer and the third most common cause of cancer death in men and women in the USA and accounts for 9 % of all new cancer cases and of all cancer deaths. In contrast, the incidence of small bowel cancer is low and accounts for 0.4 % of all new cases and 0.2 % of all cancer deaths. It is currently believed that most sporadic colorectal cancers arise from preexisting precursor lesions, including adenoma, dysplasia and recently serrated polyps, but a small percentage of colorectal cancers can arise de novo without identifiable precursor lesions. The majority of colorectal cancers develop through an “adenoma–carcinoma sequence” beginning from transformation of normal colorectal epithelium to an adenomatous intermediate and then to adenocarcinoma. 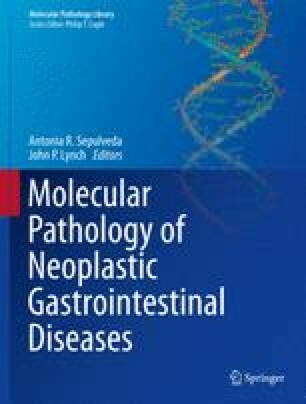 The molecular pathogenesis of colorectal cancer including genetic and epigenetic alterations has been extensively studied in the past two decades and is among one the best understood among human neoplasms.